A campaigning politician’s awakening to the “globalization, information-technological revolution and the imminent reality of a global marketplace”, planted the seeds for a dream of one day guiding Canada’s enterprising youth towards becoming the next leaders of the world stage. The nurturing of that dream, along an untravelled path up to the founding of an internationally recognized leadership program, is the story of the 5 Step Game Changer: a Global Vision. Terry Clifford, C.M., is the man who had this vision and shaped his dream into reality, inspiring thousands to pursue and realize their own dreams through a Global Vision. This book will lead you down the 'Less Travelled Road' and show you how Terry discovered its message - the 5 key steps to pave your road to success in work and in life. Each step provides insight and tools moulded from the best practices of experienced CEOs, entrepreneurs, leading educators and JTC graduates to get the experience that matters. — Nils F. Engelstad, L.L.M., Vice President, Corporate Affairs, McEwen Mining Inc.
Terrence Joseph Slater Clifford was born on November 12, 1938 in Acton, Ontario. He is anything but your average Order-of-Canada-winning-former-parliamentarian-and-high-school-principal-Ivy-league-educated-national-charity-founding-social-entrepreneur-with-a-wonderful-family-and-two-dogs kind of guy. But he is all of that too! Behind a tough football coach façade, you will find a Cornell educated science teacher and principal, who, over a nearly five-decade career, has created a world-class learning arena for young Canadians. Educated at the Universities of Toronto, Guelph, Michigan State, and Cornell, Terry Clifford revolutionized science and math education in Ontario. For more than 25 years, Mr. Clifford taught elementary, secondary and university levels. He spearheaded and developed a number of unique science and math programs, authored a number of textbooks, and was presented with numerous awards for leadership, as an educator and school administrator. Terry Clifford served nearly ten years in the Canadian House of Commons. He represented the Ontario riding of London-Middlesex where he was first elected in 1984 and again in 1988. Throughout the 33rd and 34th parliamentary sessions, Terry served and chaired caucus and standing committees with national and international responsibilities. His focus was on energy, environment, employment, free trade, transport and European Parliamentary relations. He was perhaps best known for reaching across the floor in the House of Commons and developing strong relationships with parliamentarians of all political parties. This is represented in the strong support Global Vision enjoys from all political parties to this day. Terry retired from federal politics in 1993. Armed with a myriad of experiences, Terry Clifford sought to take his knowledge and experiences to an arena where the impact would be on a bigger scale—in other words, Terry had a “global vision”. In 1991, with equal amounts of elbow grease and sharpened elbows, and with critical all-party support in the House of Commons, Terry Clifford founded the non-profit organization Global Vision. Today Global Vision remains one of Canada’s leading-edge youth education organizations, drawing on the expertise and insight of Terry Clifford’s experiences as an educator and parliamentarian. And, as he is quick to point out, with a little help from his friends. To date, his program has benefited thousands of young Canadians and provided a catalyst for maintaining Canadian competitiveness in the global economy. There is truth to the fact that imitation is the greatest form of flattery. Time and time again, other sovereign governments (often with Terry’s help), have realized the true value of bringing a competitive edge to their future leaders and have copied the Global Vision model. Every Prime Minister in power, for the last twenty-five years, has sought Terry’s guidance and advice on how to prepare young Canadians to be more competitive and lead in the global marketplace. Chief executives seek his advice on their young, evolving, global workforce and their concerns for issues such as corporate social responsibility. Educators, from primary school teachers to professors in leading MBA programs, seek his guidance on how best to teach young people to be global leaders. However, Terry Clifford has always seemed most comfortable rolling up his sleeves and getting down to business alongside his young followers, both in the classroom and in the real-life programs that characterize the Global Vision organization. Indeed, the true strength of the Global Vision program is its network of indebted Canadians who have benefited from Terry’s vision for a more competitive Canada. 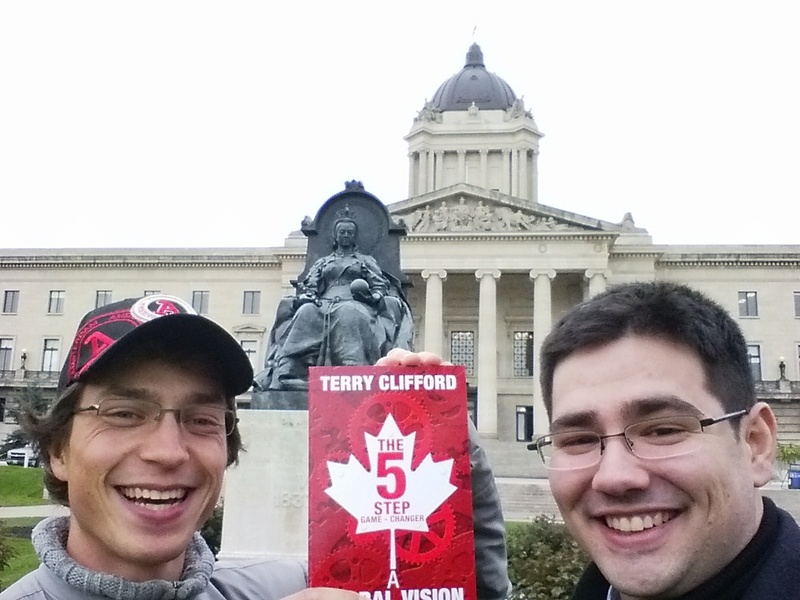 Terry Clifford embodies what it means to be a great Canadian. On May 8, 2003, Canada agreed with us, and bestowed upon Terry our country’s highest civilian honour—the Order of Canada. Membership in the Order of Canada is afforded to those who, through a lifetime of accomplishments, exemplify the Latin motto “desiderantes meliorem patriam”, meaning, “they desire a better country”. There may be no more deserving a candidate. Those who truly know Terry also know that Global Vision is a family affair. If you were to ask Terry, he would tell you that his vision and dedication for a better country, and his commitment to young people, are all inspired by his wife Ann, and his children TJ, Amy, Jake and Katie. The graduates of the Global Vision programs are grateful to them all. The story of Terry Clifford is one entwined with Terry-isms. He has so many phrases, sayings, and other profound ideas, that over the years have stuck as mantra among his friends and students. Some are authentic, others are quoted from known or unknown sources, yet all fit in perfectly and make common sense perspectives out of most situations or concepts. They serve to make things relevant to young Canadians. One of his favourites; “When The Sun Comes Up In Africa Every Morning, A Gazelle Awakens Knowing That It Must Outrun The Fastest Lion If It Wants To Stay Alive. Every Morning, A Lion Wakes Up Knowing That It Must Run Faster Than The Slowest Gazelle Or It Will Starve To Death. It Makes No Difference Whether You Are A Lion Or A Gazelle: When The Sun Comes Up You Had Better Be Running” (Source Unknown). And run, he does. At 72, when Terry Clifford wakes up in the morning (earlier than most of us), he keeps running, working to expand a global vision to even more young Canadians. He is quick to point out that all of us are better than any one of us. Please let Terry know how you will contribute to making Canada a stronger force in an ever-globalizing world. We can all start by giving young Canadians the experiences that matter. Global Vision is a Canadian non-for-profit organization founded in 1991 by Terrance Clifford, M.P. London-Middlesex (1984-1993) and Member of the Order of Canada. We bring together the best and brightest young Canadians to prepare them for success in the global economy through hands-on experiences in community leadership, international trade, politics, and diplomacy.